Staff Sgt. Eric Caban was born on March 28, 1978 in Manhattan, N.Y. He joined the Army in September, 1997. After attending Infantry training at Fort Benning, Ga., he was assigned to 3rd Battalion, 75th Ranger Regiment where he served as a sniper platoon member and team leader. In October 2001, he deployed to Afghanistan in support of Operation Enduring Freedom and participated in a combat jump to overtake Kandahar Airfield. He then left active duty to attend college in February 2002. 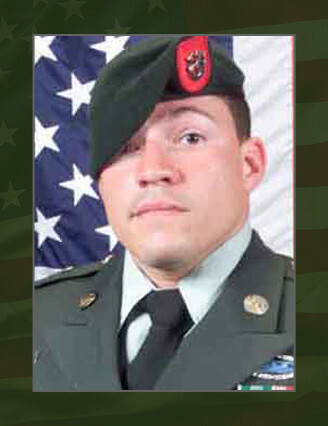 Due to his patriotism and undeniable calling to serve, Caban returned to active duty in September 2003 and was assigned as a Sniper Instructor at Company C, 2nd Battalion, 29th Infantry Regiment, Fort Benning, Ga. In December 2004, he attended the Special Forces Qualification Course and graduated in March 2006 as a Special Forces Engineer Sergeant. He was subsequently assigned to Company B, 3rd Battalion, 7th Special Forces Group (Airborne), Fort Bragg, N. C.
Caban was a graduate of the Special Forces Engineer Course, Sniper School, the Special Operations Interdiction Course, the Survival, Evasion, Resistance, and Escape Course, the U.S. Army Ranger School, the Basic Noncommissioned Officer Course, the Primary Leadership Development Course, and Airborne School. His military awards and decorations include the Army Commendation Medal, three Army Achievement Medals, Noncommissioned Officer Professional Development Ribbon, Army Good Conduct Medal, National Defense Service Medal, Army Service Ribbon, Global War on Terrorism Expeditionary Medal, Global War on Terrorism Service Medal, Combat Infantryman Badge, Basic Parachutist Badge with a Service Bronze Star. He has been posthumously awarded the Bronze Star Medal for valor, the Purple Heart, the Meritorious Service Medal and the Combat Infantryman Badge. Caban is survived by his father Efren and mother Iris, and his brothers Efren Caban Jr. and Edwin Caban.